1) Last week, I had to scrap a review when a restaurant — Oakland’s Grand Fare — closed suddenly during the short span of days between my phone interview with the chef and the day the story was supposed to run, marking just the second time that’s ever happened during my tenure at the Express. The first? When the Laotian restaurant Souk Savanh (1927 International Blvd., Oakland) got shut down by the health department in May, just days before my enthusiastic review was supposed to drop. But on this latter front, I have good news to report: Souk Savanh reopened two weeks ago. Co-owner Nai Saelee told me there’s a new chef in the kitchen, but that the menu and recipes are more or less the same — which hopefully means the restaurant still serves some of the most delicious Lao food in town: the crunchiest nam kao (rice ball salad), the most addictive chicken wings, and a variety of soupy noodle dishes that are perfect for these chilly evenings. According to Saelee, the place looks pretty much the same too, apart from the installation of new flooring, new tables, and — most importantly — a new grease trap for the kitchen. 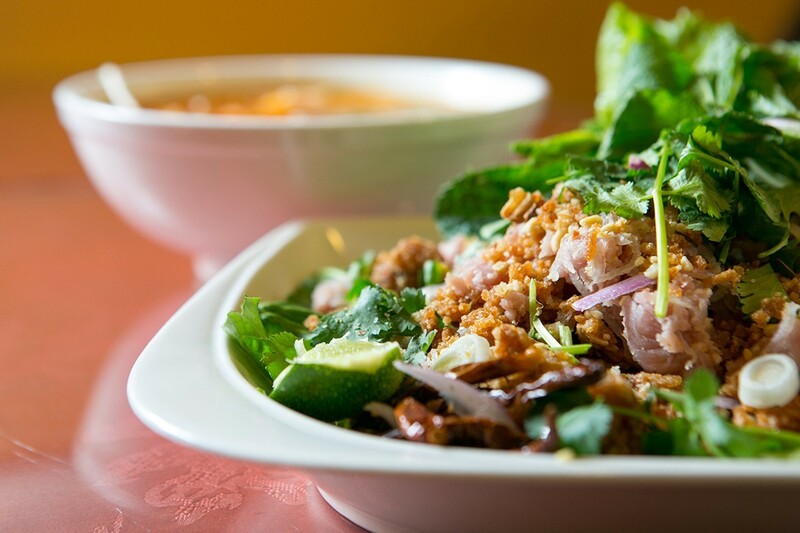 Souk Savanh is now open 11 a.m.–3 p.m. and 5–9 p.m. daily. You can follow the restaurant’s Instagram account for updates. 2) Berkeley’s newly remodeled Claremont Hotel — now known as the Claremont Club & Spa — is getting a new restaurant with a big name attached to it. Inside Scoop reports that Dominique Crenn, of San Francisco’s Michelin two-starred Atelier Crenn, is working as a consultant for a new brasserie at the hotel, which is slated to open sometime in early 2016. Crenn, it should be noted, won’t be the chef at the Berkeley restaurant. 3) Elsewhere in Berkeley, Berkeleyside Nosh reports that the Mandarin Restaurant (2025 Shattuck Ave.) was gutted by two fires that struck early Friday morning. No word yet on when (or if) the restaurant plans to reopen. 4) Tablehopper has the scoop on a big change at Chez Panisse: Co-chef Jerome Waag will leave the most highly decorated of Cal cuisine eateries in January in order to open a restaurant in Japan. Amy Dencler will replace Waag, alternating six-month shifts with the other co-chef, Cal Peternell. 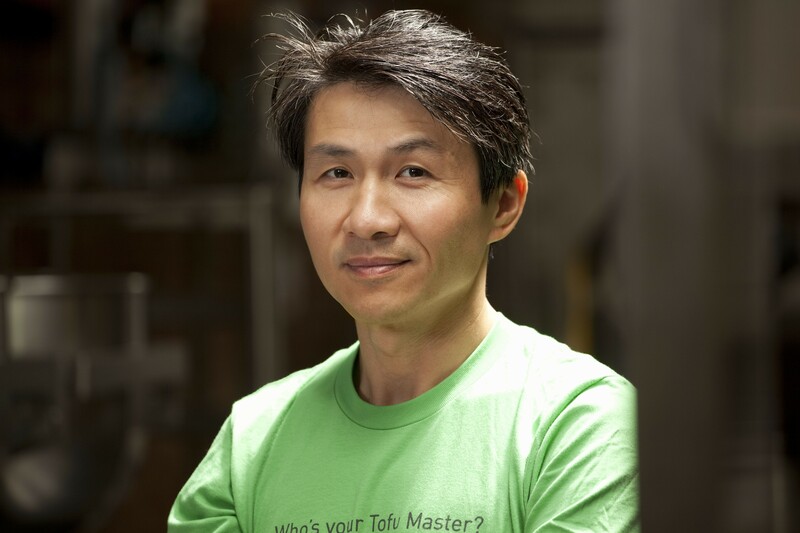 Hodo Soy founder Minh Tsai. 5) Oakland-based Hodo Soy is expanding. In a story that bids farewell to a two-generation family tofu business in Sacramento, the Sacramento Bee notes that Hodo Soy will take over the old Sacramento Tofu Co. production facility, likely doubling its current 20,000-pound-a-day production capacity. 6) In preparation for opening its first US location in Walnut Creek, Telefèric Barcelona is doing a Spanish popup dinner at Calavera this Sunday, December 6 (5:30–10 p.m.), in collaboration with Calavera chef Christian Irabien. According to a press release, the a la carte menu will include a selection of pintxos (two-bite snacks) and larger plates like wood-grilled octopus and a jamón Ibérico burger. 7) There are a number of beer events coming up, including The Trappist’s (460 8th St., Oakland) annual Kerstbier Fest, during which the bar will pour 21 winter/Christmas beers from both the Bay Area and around the world. The festival will start at 5 p.m. on Friday, December 11, and will run all day Saturday, December 12 as well. $27 buys a four-beer flight. 8) Two more in San Leandro this weekend: 21st Amendment Brewery (2010 Williams St.) is throwing a 1930s-style Repeal Day celebration on Saturday, December 5, in honor of the date — December 5, 1933 — when the ratification of the 21st amendment officially ended Prohibition. Period costumes are encouraged, and there will be live Dixieland jazz. Admission is free, or you get a slight discount on food and beer by buying an early-bird package in advance. Meanwhile, Cleophus Quealy Beer Co. (448 Hester St.) is celebrating its one-year anniversary, also on December 5. 9) Finally, ICYMI, I wrote about Pizza Matador, a new pizza delivery service started by two longtime pizza drivers.